It’s not surprising or unusual that, with a couple of exceptions, most of NDTV’s female anchors are fair and lovely. True for other channels too. And they get fairer in the studio than while reporting from the ground. So some years back NDTV had this great debate on “We The Poodles” on whether Indians preferred fair skin. Reason for the debate? Excessive marketing of fairness creams in the market. They had all the beauties and advertising gurus on the show sparring over the issue. Every aspect of skin-colour preference was heatedly argued. All except one – Do fairness creams really work? Now, if the debate had conclusively established that these creams don’t work then it would have been a big blow to the fairness industry. That would have also meant a big blow to ad revenues for the channel. But TV debates aren’t meant to establish anything but deliver the good drama and theatre they are supposed to. So the tone of the debate was more on the ‘racist’ bias of Indians toward fair-skin rather than spurious creams. P. Sainath, award-winning journalist, once remarked in an article that the Times of India had long become a vehicle for marketing as against a journal. There have been long periods when TOI has even gone without a proper editor. The simple reason is that TOI is clear who its readers are. Recent combative ads by The Hindu pretty much describe TOI as a paper for the page-3 watchers. People who don’t seek to be educated but who are sure to know the nick-name of Hrithik Roshan (Duggu). I often joke that the most ardent watchers and fans of NDTV have to be those who have a mini-bar at home. Frankly, there is nothing wrong if NDTV has clearly identified its segment and caters to their tastes. Trouble only starts when they also extend their preference on important topics to find users to suit their tastes. Diesel prices had gone up, and the input desk at NDTV in New Delhi had dispatched me to get reactions from customers at a gas station. Vox pop, they call it in the business, the voice of the people. I was interning in reporting that very hot month of June, so off I went…. Except that it was Saturday morning. Except this was diesel. Only a handful of people passed through the gas station for diesel that whole couple of hours, but I did speak to them and uplink their reactions back to the newsroom…. but I received a call from the edit bay telling me that the reactions I had got were not good enough and that I’d have to get more. I can’t remember exactly what I was told was lacking in the footage, but I remember the gist of it: the people didn’t look good/educated enough for TV. They spoke Hindi too. There’s a word for that in India: ghhaati. Low class. But it was a story about diesel. The only people who bought diesel at gas stations were truck drivers, autorickshaw drivers…and other people’s drivers in general. Weren’t these the people whose reactions you’d want in a story about diesel? They were the ones who’d be affected by the price rise, right? I didn’t understand the issue with the Hindi either. Sure, we were an English channel, but we subtitled non-English footage all the time. It was not a big deal, so what was so different this time? I’d tried explaining that to the person who’d called me from the newsroom, but I was very silkily asked to just get some English bites from better-looking people who weren’t uneducated drivers…I got it. They wanted freshly-scrubbed white-collar reactions for the white-collar-catering Inglis channel. Didn’t matter if white-collar India didn’t care about diesel prices. Such people? Dark-skinned people from lower-income families? But what about the content? That footage never made it on the air on our English channel, but our Hindi channel ran it all day long. So the English channel only showed the good-looking people of India? But what about content? What about what we had initially been told at NDTV about journalistic ethics and the real issues and how journalism was supposed to be a pillar of democracy, the voice of the people? Or was it the voice of certain sections of the people depending on the segment of India you were catering to? The unattractive sweaty Indian is also a part of India. In fact, he is about 90% of India. Journalistic ethics! Pillar of democracy! Voice of the people! I broke out in laughter. If only Khadija Ejaz had met me before interning at NDTV I would have explained to her what to expect. I would have asked her to first check out the areas and houses where all the ‘best’ journos lived. She wouldn’t find sweaty Indians there. She would have then been trained on which people to interview. She confuses ‘trucks’ for real trucks. In our TV channel lexicon ‘truck’ means those swank SUVs driven by people who don’t sweat or stink. Khadija should have spoken to me before-hand. I would have educated her on what Barkha Dutt, and even Sagarika Ghose, really think of middle class and lower class Indians. She should have read many of their articles. At the very least I would have shown her Sagarika’s tweet about “Ugly Indian males”. Never mind! Khadija has the benefit of learning the ropes the hard way. That if and when you apply for work at NDTV or any Indian TV channel make sure you use an abundant dose of Fair & Lovely. Make sure you invest in the best of deodorants or perfumes. Nothing wins like a ‘sweet smelling’ journalist. 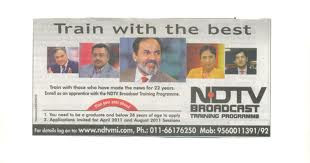 Come January NDTV will have another of their training school ads out. I recommend they make a small correction though. Instead of ‘Best’ I think “Train with the Beast” would be far more appropriate. Congratulations for running this excellent blog exposing 'behind the scenes' secrets of the paid media. I hope more and more people read it an know the truth. I was expecting this after yesterday. a brilliant article. just a few comments bout the last para.. u forgot the fair & handsome :) for males. also Flipkart has launched COD purchase of perfumes, EDT, deo etc . LOL! Poor Lady! she had all the lesson of her life in a ziffy. With so much exposed, NDTV can only survive if its patrons are strong and they are strong. So, it survives! i was watching barkhas' program last night about SITA! what a filthy character she is.. i enjoyed watching her dirty face when she got good retort from rahul eshwar! Whats the point in making personal comments? Many dislike her brand of journalism. but there's no gain in making derogatory remarks. Show some class. because she was talking about SITA and her comments on SITA were so bad. Kindly see that program on sita, and you can understand why im so angry! I did see the program. And I didn't find anything offensive about it. You may not agree with her but there was nothing hurtful or offensive to my religious sentiments. Everytime you use foul language, you give an opportunity to these fake secularists to point fingers at you. This dilutes your own argument and completely changes the point of debate. The debate should be about bad journalism, biased journalism, paid journalism and incompetent journalism. When you have enough ammunition to nail them, why talk about their "filthy character" and "dirty face"? Why give them an opportunity to escape REAL scrutiny? im convinced, and will not repeat this! Chakradhar, U R Great. Inst ed of arguing shallowly U accepted Hari's logical line of Thought.Its a Gentleman approach. Respect to you. Exactly..NDTV is for "those with mini-bar at home". True or not , u would find most of the girls on NDTV from this very School and I believe Radhika Roy is also from same school. Nothing wrong , just shows the mindset described in your post. I stopped watching it after Barkha Dutt revelation anyways. Have you seen the controversial decision passed by cabinet regarding amendment of " Hindu marriage law", giving women half a share in the husband's residential property irrespective of whether it was acquired before or during the marriage in case of divorce. This overwhelming biased law against men, Which could endanger the very fabic of marriage as an institution, don't even find mention in any news channel. Even TOI has put a small article in the middle section of its paper. Why liberity is taken only with " Hindu marriage law" only?? Are they trying to uphold the Indian Family of break it down to pieces. Its a Complete violation of fundamental right of individuals which is not there anywhere in the world. Why a man has to pay for this to the woman who wants to separate ? And that too even from what he earned before marriage. Sonia ghandhi is a christian. Salman Kurshid is a muslim. They decide Hindu Law. Hindus donot touch muslim or christian law. Why should they play with Hindu sentiments ? Looks like full fledged plan to kill Indian culture in the name of women liberalization. Salman Khurshid gave Hindu women the right to half the residential property even if the property was the result of the hardwork of the parents of her husband. Well, now Hindu men must think twice before deciding to get married :D I wonder if the law is also applicable to men of other religions. Or, is it that only Hindu men are wretched wife-beaters and therefore Hindu women needed this legislation to have a secure marriage? hi, you are wrong about the term 'ghaati'..and i am surprised you did not get into the truth about this one...the word is used as a derogatory term by years of abuse (read: tone, manner of portrayal) by the very english-speaking 'convent educated' punjabis who migrated to mumbai in 1960/70's..i have seen my ex-friends use this as a word of abuse towards all maharashtrians for several years ...(btw, i got nothing against either migrants or punjabis, but this blog is about the pursuit of truth) and the abuse is no different from how 'madrasi' was dished out to every one from the south or the term 'lungi wala' to people from kerala. maharastrians especially from konkan use the term 'from the ghats" to describe people who live up on the hills and travel down to the plains for work. period. i sincerely hope you correct your blog! "I often joke that the most ardent watchers and fans of NDTV have to be those who have a mini-bar at home"
All the news on these MSM channels is slanted and so are the debates rigged. If any panelist strays, he/she is shouted out by the likes of BD, SG, RD, AG etc. Today views have become news. That too views of some two bit greenhorn reporter who does not even know the Arse from the elbow. Yea, I agree NDTV is after good looking chiks but why on earth they hired Barkha - she is an ugly brat. she has no sense - most of her programs are out on a different tangent than the real world. There is so much which can be reported by media but it gets encashed by not publishing the real news. For eg there is no sting to expose encroachment mafia, Likewise with the road/pothoes repair scam which has prevailed for decades. On this expose of the mindset in NDTV I can only say "Shame on NDTV". What Goes On Within Four Walls Of NDTV?